Astrophotographer Lovro Dujnić captured a close-up of a Harvest Moon taken in Zagreb, Croatia, on Sept. 8, 2014. 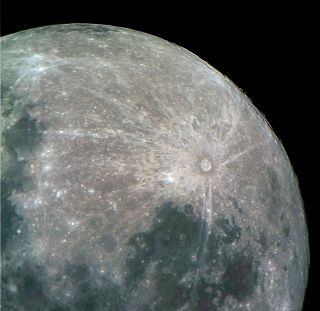 Tonight (July 31), there will be a Blue Moon in the sky. In a coincidence of cosmic proportions, the second full moon of July rises tonight, making it a so-called "Blue Moon" — and Blue Moon Brewing Co. will celebrate its 20th anniversary by painting the town red. A celestial Blue Moon comes around roughly every 2.7 years. Tonight (July 31), a Blue Moon will rise on the same night as Blue Moon Brewing Co. celebrates its 20th anniversary with parties and events at more than 750 locations across the country. In Denver, where the company is based, there will be a concert under the stars — and the full Blue Moon — capped by a "specialty beer release." The phrase "Blue Moon" commonly refers to the second full moon in a single month, although this hasn't always been the meaning of the term. Tonight's Blue Moon will be the same color as any other full moon, although volcanic eruptions and forest fires have been known to cause the moon to appear blue. This effect is caused by particulates like dust and smoke, which can act as a natural blue filter in the sky. The logo for Blue Moon Brewing Company's 20th anniversary celebrations. In celebration of its 20th anniversary, Blue Moon Brewing Co. (which is owned by the Molson Coors Brewing Co.) will release a new beer that is part Belgian-style white and part Belgian-style Tripel. (It's not space beer, but we'll still try it). "The smooth-bodied ale has a warming finish and hints of coriander, orange peel, fruity esters, spicy esters and a touch of sweetness," brewery representatives said in a statement. The company's founder said the beer brings back fond memories of the time he spent earning his Ph.D. in brewing studies in Brussels. "As a brewery, we've come a long way in 20 years, and we're excited to celebrate this with the people who got us here — our fans — and the things they love most: food, music and great beer," Keith Villa, founder and head brewmaster of Blue Moon, said in the same statement. The big concert of the night will be at Coors Field, featuring Big Data with special guest Robert DeLong, but it will only be the froth on an evening of festivities. The party starts in Lower Downtown (where Blue Moon was created), where there will be four rooftop concerts. Blue Moon plans to open another brewery and tasting room in Denver's River North neighborhood. A full listing of nationwide concerts is available on the company's home page. To register for a pass to the events in Denver, go here. Have a neat photo of the celestial blue moon to share? Get in touch with us at tmalik@space.com.